A child laughter is always a happy song singing to our ears . You will not get bored or annoy by it. Therefore hanging around with children make you felt younger and indeed help you stay energetic. I do not dare to promise anything. 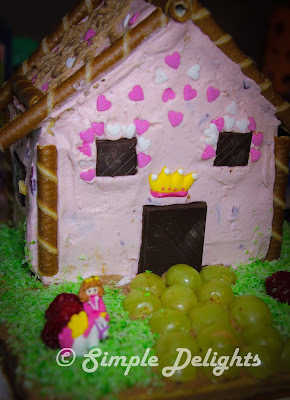 Though I know this is the cake I would like to make - House Cake.I saw this cake last year from the blog. Have been looking for an occasion I can make this cake and not to eat it by myself ( it is not wise to eat a whole house of cake ^^) . However not knowing how well I will success in making this cake. I just told them hopefully it will be a surprise. 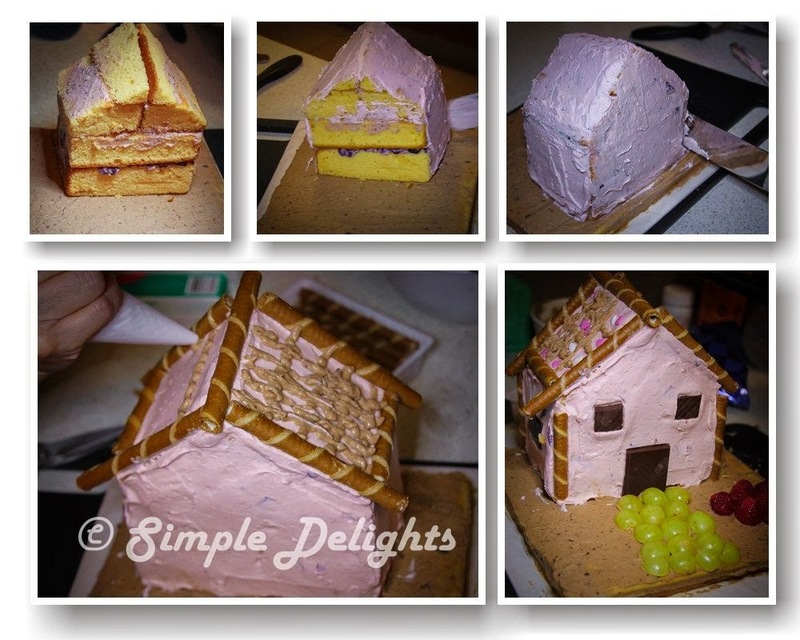 So here is how to build the house ..
1 piece of 8" butter cake with 2" height. 1. Puree the blueberry and press through the sift . 2. Mixed the fine puree with the whipping cream. 1. Put the water in a bowl and sprinkle gelatin in it. Mix well and place in a bowl of hot water to have it melt. 2. Whip pouring cream till stiff peak. 3. Pour the melted gelatin into the strawberry yoghurt and mixed well. 4. Fold the whipping cream into the strawberry yoghurt mixture. To make the grass - Desicated coconut mix with some pandan ecessene. Candies , green grapes , raspberry , biscuits , anything you think your kids will like. 1. Level bthe butter cake and cut into precisely half. 2.Spread the blueberry cream ont he half of the butter cake and place it on top of the other buttercake. 4.Lift up the 1/3 portion of the cake to standing position , cut diagonally into 2 triangles. 5.Place the 2 triangle together to form a roof and join them with the blueberry cream. 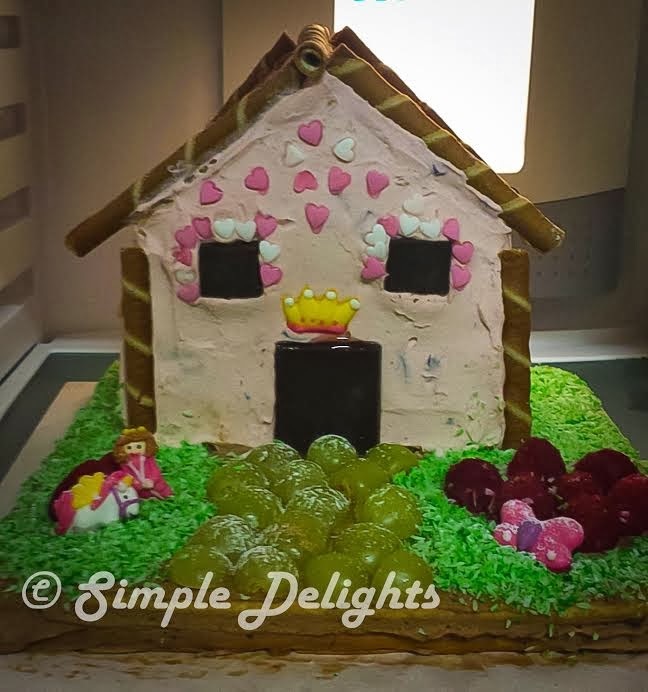 6.Place the roof on top of the remaining 2/3 of the cake. Joint together with blueberry cream. Now the house has been form ^^. 7. Spread the chocolate cream on the sponge cake, place the house on top and position as your preference. 8. Spread strawberry cream to cover the house and cream as smooth as possible and start to decorate the house to your liking or the liking of the litte one. I love to have fruit on my cake and try not to put too much of candies. So I build the house with green grapes as path leading to the door and have a bush of raspberry as roses and green grass. I have little princess & horses candies. Afterall is still a little girl cake. Beside making a ginger bread house this year, maybe can try to do a house cake as a beautiful dessert. If you have the little one I am sure they will love to decorate the cake with you.